What is strength and conditioning? Whether you’re just getting into the sport or looking to upgrade before Adventurethon or your next multi-sport or paddling event, we are fortunate to now have a wide range of kayak and surfski distributors in Townsville; each brand suited to its own niche. We found out exactly what each brand is about, who it’s best suited to, and the key features and tips to make your purchasing decision a lot easier. BUYING TIP While we showcase some of the models within each brand below, please note there are often up to four versions of that model according to manufacturing material, which affects weight and speed. Please go to the websites of each brand for the full range on offer. Embracing the philosophy that kayaking in all its forms should be accessible to all who wish to venture onto the water, Finn Kayaks are known as a fantastic choice for beginner and intermediate paddlers, and those seeking durability. They’re built from polyplastic to suit local tough Australian conditions. 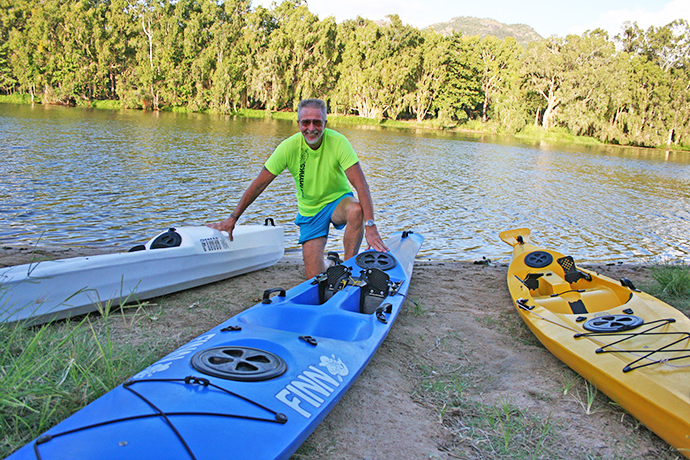 Finns are a perfect fit for their new North Queensland distributor, Hans Preuss, who has been paddling for 30 years; both competitively and socially; and runs kayaking tours and kayaking fitness classes for Over 50’s using Finn Kayaks. Afinnity Kayak – This ‘sit-on’ 4.2m kayak is versatile, easy to paddle, manufactured in seamless rotamoulded polyethylene that’s extremely durable, and is UV resistant for 10 years. It’s a great choice for beginner to intermediate paddlers who want to hit to river or cruise across to Maggie, and it also has the practicality of storage hatches. Endorfinn Surf-Racing Ski – 5.2m in length, the Endorfinn has the size to ensure that it is a fast boat, yet retains Finn design characteristics that guarantee strength to cope with the punishment of the ocean, and the manoeuvrability and stability that makes the intermediate-level Endorfinn a pleasure to paddle and race. Molokai Ocean Racing Ski – Moving to a more elite level, at 5.9m this highly efficient ski is very strong, durable and built to deal with all conditions comfortably and confidently. There’s limited storage, but it will perform in the ocean at any level. 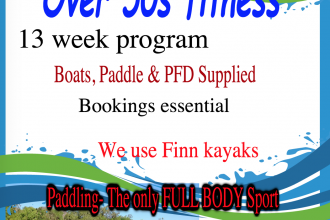 More from Finn Kayaks here. Best suited to: People just getting into paddling, more mature paddlers, and those who want to paddle for fitness or to explore. You can certainly use Finns for racing, particularly the Molokai skis, but these boats are generally designed for stability and durability than speed. Biggest benefits: Safe for beginners, durable, stable, plenty of storage space for paddling trips out exploring. Order time: There’s a four-week turnaround on orders. And one more thing: Hans has also very recently become the agent for Mirage Sea Kayaks in North Queensland. These open deck sea kayaks combine agility and speed while managing swell and broken waves easily. They are ideal for touring and exploring with great stability and plenty of storage. Check out the full range here and start planning your trip to Hinchinbrook. Onto his sixth ski over his eight years of adventure racing, Sam Stedman is no stranger to searching for the ideal craft and last year, in partnership with Cycle De Vie, became the Epic dealership for Townsville and North Queensland. 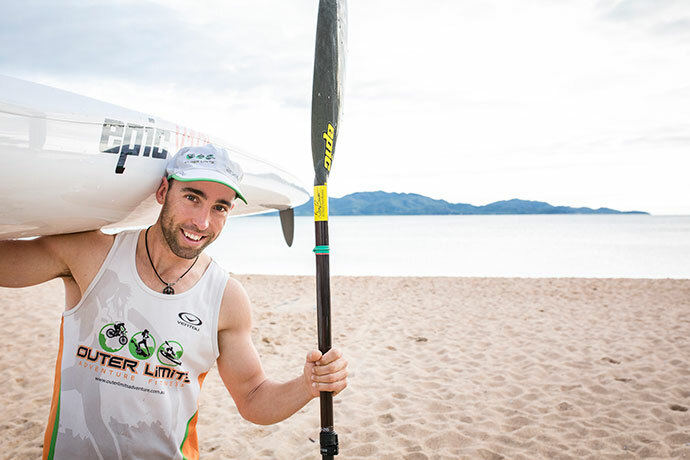 Sam uses an Epic V10L in his own racing and – through his business Outer Limits Adventure Fitness – helps to place adventure racers into their ideal boat. He has a demo Epic fleet on the Outer Limits trailer that can be tried and tested. Epic V8 Surfski - Fast, yet extremely stable, this is a surfski that most kayakers should be able to hop right onto and paddle off. With a length of 5.48m and a width of 55.88cm, it’s designed to bridge the gap between sea kayaks and surfskis by blending speed, high stability and a performance oriented deck and outfitting. Epic V10 Surfski - Incredibly fast and agile while maintaining comfortable stability, the Epic V10 (6.45m long and 45cm wide) really shines in downwind and upwind heavy sea conditions. There are a few different versions to suit various sizes of paddler and maintain comfort and stability. 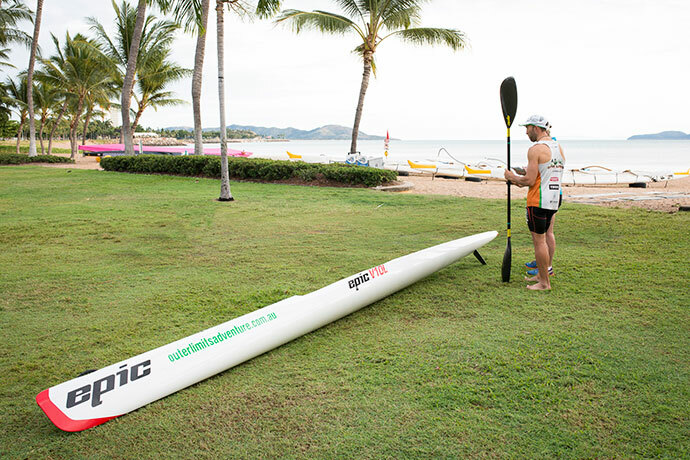 Epic V14 Surfski – The goal of the V12 was to make the fastest surfski possible. Mission accomplished. Until the V14 came along. This boat is designed for mid-sized water conditions and has an even sleeker shape and narrower waterline to its V10 and V12 counterparts. With a much narrower bow, the V14 knifes through wind chop and small waves. Sam Stedman with his Epic V10. More from Epic Kayaks here. Best suited to: There’s a range of models to suit various abilities but – aside from the new polyethylene V7, which is a rotomoulded surfski that offers similar stability to the best-selling V8 – these are generally fibreglass skis that are built for speed. They are great to step into if you’ve been building your skills in a plastic boat and want to take it up a notch. Biggest benefits: Epic surfskis are known for their efficient hulls, fast-draining bailers, comfortable cockpit and their ease of use. Order time: If it’s not in stock, the order will arrive in about two weeks. And one more thing: Sam says the paddling skill in Townsville is definitely growing and he’s seeing more glass skis on the roofs of cars than ever before. 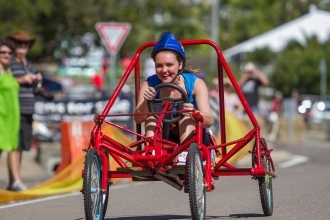 “In the five years that we’ve had Adventurethon in Townsville there would be one glass ski on the start line, but now if you want to be anywhere near the top half of the field you need an ocean-racing ski,” he says. Joel Savage in a Stellar while Katrina from TheGo tries a Knysna Racing Kayak. 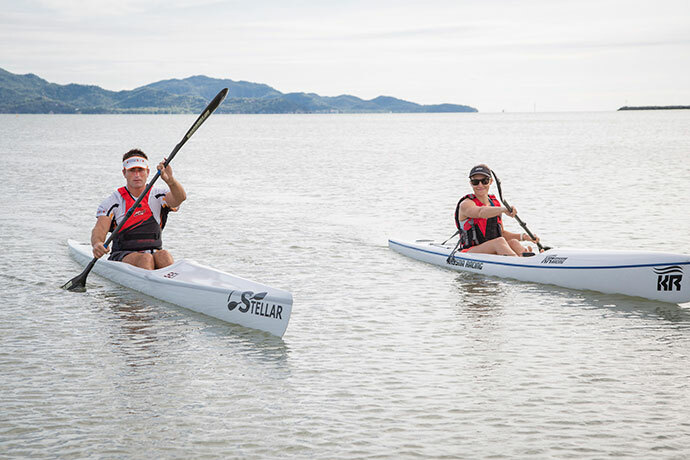 Stellar SR – At 5.84m long and 48cm wide, the Stellar Racer (SR) is the most popular choice for Townsville paddlers and is a good option for those wanting to transition from a touring kayak, or for sea-goers who aren’t used to rough weather. It’s regarded as a comfortable ski with an impressive blend of speed and stability and suits paddlers of all sizes. The redesigned 2015 models have a tighter catch and low volume cockpits to increase performance. 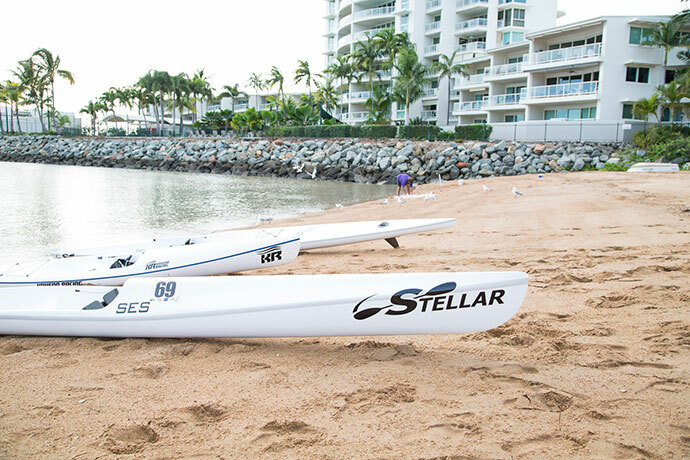 Stellar SEi – The Stellar Elite Intermediate (SEI) surfski provides experienced paddlers with an all-condition boat that has high top-end speeds as well as great stability in rough conditions. At 6.1m long and 46cm wide, the SEI is often the pick for intermediate paddlers looking to refine their technique in heavy seas without losing speed. 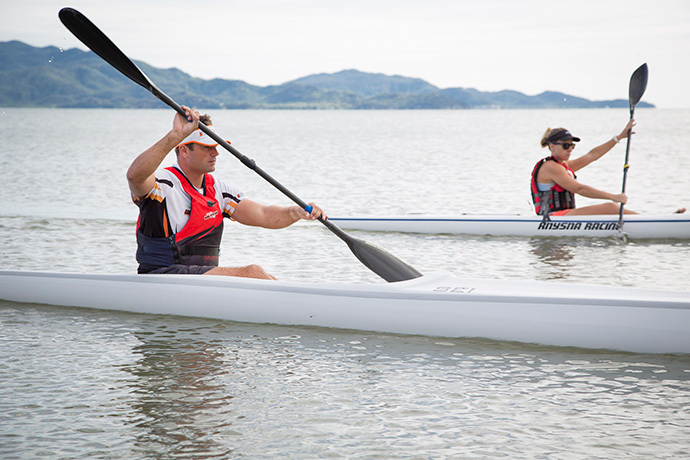 Stellar SES – The Stellar Elite Small (SES) is optimised for smaller to mid-sized paddlers. At 6.2m long and 41.6cm wide, all dimensions of the ski – and the wetted surface area – have been designed to deliver a very speedy vessel for skilled paddlers. Recent modifications include a more angular deck to optimise the paddle entry at the catch and a reduced volume in the footwell. Best suited to: These boats can cope with a wide variety of paddlers: Competitive types who are looking for a decent top speed and to land on the beach within minutes of the best paddlers without compromising balance; or those seeking a wider and more stable boat like the S18S or S14S (up to 130kg); or SES which is designed for lighter paddlers at 90kg or less. Biggest benefits: Lightweight for accelerating into runners (waves) or getting off the roof of the car (15kg for the entry model Stellar SR, and down to 10kg and 11kg for the ‘Ultra’ and ‘Excel’ SR skis); efficient, and stable with a design that doesn’t compromise balance. Also innovations like the three-point footbrace transfer your leg-drive-to-boat speed, making the Stellar Elite (SE) series of skis comparable with the fastest boats on the market. Order time: Can vary between two and four weeks, but if the boat is in stock you can have it straight away. And one more thing: Joel says: “Ninety per cent of my customers choose a Stellar SR and most people will go with a Sport [15kg] or Advantage [14.6kg] series for their first ski, just to make sure they enjoy paddling before they invest. But if you can go to an Excel [11.5kg] straight away, it’s worth it because they offer great acceleration and an improved top speed, plus they’re easy to lift off the car.” Joel also stocks Knysna Racing Kayaks Jester boats, which are great value and ideal for women and kids (they weigh just 13kg). Carly Lubicz is combining two of her great loves — writing and getting active. Previously working as a journalist, sub-editor, and editor in newspapers and magazines; she is editor and co-founder of TheGo Townsville. She stays active with the staples of road cycling and yoga, but has recently discovered triathlon. And become addicted (apart from the swimming part). She also has a Cert III in Fitness and is passionate about improving mental health through physical activity. Like this article? Signup to our weekly newsletter for the latest articles, competitions, and upcoming local events.